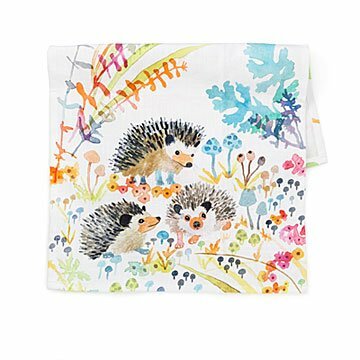 Betsy Olmsted's array of hedgehogs inhabits this colorful kitchen towel. A group of hedgehogs is called an array—a rather stuffy term for such an adorable bunch. But Betsy Olmsted's colorful painting makes it clear that the hedgehog 'hood is a laid-back place. Digitally printed on an absorbent, 100% cotton tea towel, her scene of the bristled creatures with mushrooms and foliage has a charming, vintage vibe. They make a great gift to brighten any array of kitchen linens. Includes twill hanging loops. Made in India. Machine wash and dry; iron as necessary. A nice little gift. I worry a bit that it will need ironing after washing. My best friend LOVES hedgehogs, so the second I saw this towel, I knew she'd love it. The colors are so happy and bright and these little guys are so cute! I ordered it because of my love of Hedgehogs...when it arrived I was so surprised. It is Beautiful. Because it looks more like a piece of art than a tea towel, I am going to canvas wrap it to hang in my kitchen!!! Beautiful vibrant colors and excellent quality material. It's awesome! !